Firing an AR rifle accurately is not easy at the mid or short range, even more so when you try to use it at a fast pace and different targets. However, despite being highly complicated, there’s still a way to improve your overall accuracy & precision with any AR rifle – using the Vortex Spitfire 3x. With its compact build, complete set of features and well-made design – the Spitfire 3x using an AR rifle has never been as easy as it is now. 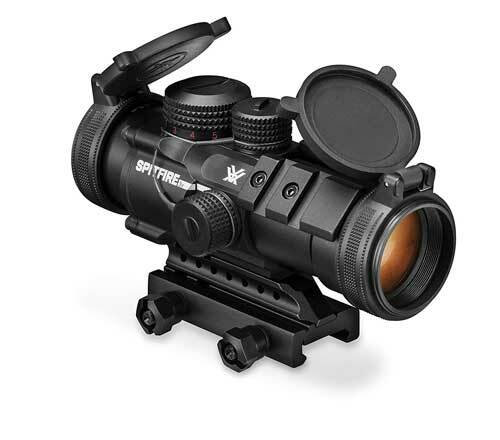 Especially for those who need significant accuracy and excellent comfort at short range without sacrificing any quality on the mid-range performance – this scope is a fantastic pick. Taking into consideration the vast array of high-quality features and its overall construction standards there’s almost nothing negative to say about this excellent accessory. But despite that, it is still not perfect. Want to know why? Keep reading! EBR (Enhanced Battle Reticle) is maybe the one feature of the Spitfire 3x that makes it stand out from the crowd. Even though it looks simple & straightforward to every other reticle in the market, the EBR-556B is designed to provide the perfect experience and performance for the AR rifle. Actually, the reticle is so good that it works both at close and far ranges without problems, even providing a holdover and references for over 500 yards, which no other simple-looking reticle can provide. On top of this, you need to consider that the reticle is etched on the prism, making it a lot easier to use it and to spot targets while aiming. And of course, the reticle provides the perfect fast-focus for quick response and targeting, especially convenient during close & dynamic ranges. The single-piece chassis is one of the lightest in the market. But this lightness doesn’t make it torpid when it comes to delivering excellent resistance & durability. As when you grab the scope, immediately you feel the quality of its build – a sturdy, robust, very reliable build for those looking for a long-term shooting accessory. And the design is not only durable, but it is also resistant thanks to its o-ring sealing method, which prevents moisture, debris, dust, and even fog to damage the vision – thanks to a nitrogen purging method of construction. What’s even better, the construction is rugged, uniquely designed to superior shockproof and better recoil resistance – even with the harshest of uses. And of course, despite all this durability & resistance – it still looks really good, thanks to its low-glare matte finish on its anodized paint. What makes this scope excel in close-range and quick-shooting activities is the fact that it is much smaller than others with the same features. And of course, this compact design doesn’t only offer a small build; it brings a wide array of versatile features. From the reticle to the prism, the optical system of the Spitfire 3x allows users to enjoy the fastest and most accurate aiming without sacrificing quality or vision, helping those tactical users to enjoy and get the best from it without problems. Another critical design feature to consider is the multi-height mount that allows shooters to pick 30mm or 40mm heights, while also helping to add auxiliary reflex accessories thanks to the Picatinny rails. The most versatile design in the market without a doubt! When we talked about the EBR-556B reticle, we didn’t mention how perfectly it fits the overall optical quality of the Spitfire 3x. With the ability to change between red and green and up to five intensity levels, the EBR reticle alongside the multi-coated lenses and anti-reflective design helps to get much brighter and sharp vision. In the long run, with the reticle and fully illuminated optical experience, aiming & locking targets with the Spitfire 3x is a total piece of cake.Especially, if you configure it according to your needs. At 3x zooming ability and an eye relief of only 2.8 inches, you can’t expect much from the Spitfire 3x when it comes to providing many adjustments. Although you can find the windage and elevation adjustments convenient, they are not as good as others scopes. On the other hand, you can find the control knobs may feel harder than expected, making it even harder to control/adjust the many options you have on the accessory. But this, compared to horrible adjustments in other scopes, is still pretty decent unless you are too demanding and want a tremendous long-range precision. Will the Vortex Spitfire 3x Deliver a Top-Notch Experience? There’s almost nothing about the Vortex Spitfire 3x that could draw you back from its quality & overall performance-oriented design. Yet, it is far from being a perfect accessory if what you’re looking foris adjustability and long-range accuracy. You won’t obtain the best adjustments that will help you aim at different ranges, and won’t either receive the most efficient aim accuracy on the market. But indeed, thanks to its reticle and overall construction, you will receive a well-rounded design that will help you have a fantastic experience whether you want it for tactical or hunting activities. If you are expecting a scope for long-range shooting on sniper-like guns – then the Spitfire 3x won’t help you at all. 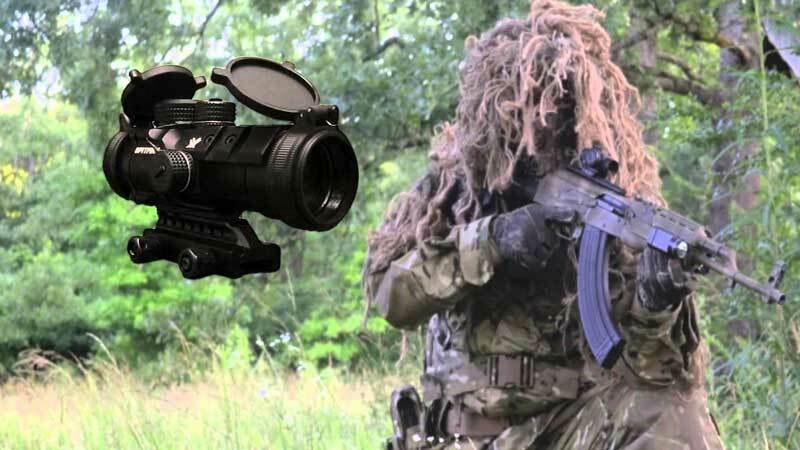 However, if you know that this scopegoes better with an AR at short and mid-range distance while providing the opportunity to be fast, reliable, versatile and durable – then you will undoubtedly get a top-notch product.